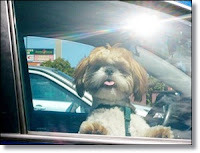 Sacramento, California - Californians who see an animal trapped in a hot car can now break a window to set them free without fear of prosecution under a bill signed over the weekend by Gov. Jerry Brown. Rescuers can break into the car as long as there is no other way to free the animal, for instance if the animal appears to be in peril, the car is locked and law enforcement is not arriving quickly enough. The rescuer must stay at the scene until law enforcement respond to the situation. The bill was introduced after a series of incidents in which dogs died after being left in closed cars on hot days. Many of those cases have led to criminal charges. CBS San Francisco reports Assemblywoman Ling Ling Chang co-sponsored the so-called “hot dog” bill. To see how a dog would feel, Chang and the other politicians behind the bill locked themselves in a car without air conditioning on a hot day. After just eight minutes, the politicians couldn’t take the heat. “We need to highlight the point that we are cooling down by sweating and dogs can’t sweat. A dog would be dead by now,” Chang said.